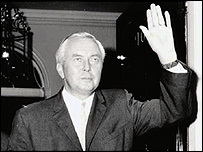 Having just scraped home in 1964, Harold Wilson knew he would have to face the country again soon. Labour's priority then must have been to project an image of a party fit to govern. But when the largest balance of payments deficit since the war was revealed it only highlighted the government's shaky position, as did defeat in the Leyton by-election. The loss cut Labour's wafer thin majority and dashed the hopes of a Commons return for Wilson's choice of foreign secretary, Patrick Gordon-Walker. 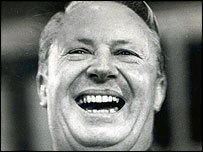 But as 1965 saw Labour fare badly in local elections the Conservatives treated defeated leader Sir Alec Douglas Home with traditional ruthlessness, installing Edward Heath in his place. In Heath the Tories hoped they had found their answer to Wilson. Oxford educated, the former Tory chief whip triumphed in a three-way contest, beating Reginald Maudling and Enoch Powell. The tricky tactical position of the Liberals was made plain when Labour ignored overtures from party leader Jo Grimond to lend his support to the government - even with parliament balanced on a knife edge Liberal attempts to win influence were ignored. As the months passed, Labour's grip on power tightened, and with a surprisingly solid swing towards the government in a by-election in early 1966 Wilson decided the time was right for Labour to gamble on winning a solid mandate. A Labour collapse had seemed possible after the slender victory of 1964, but by the time the politicians hit the campaign trail in the spring of 1966 Gallup was giving Labour a double-figure poll lead. But this campaign lacked the spark of the previous contest. Labour minister Barbara Castle later described it as "one of the most boring I have ever experienced". Nevertheless George Brown, Wilson's deputy, took up his by now traditional national speaking tour in the hope of stirring up the voters. The Conservatives had not had the chance to recover from their defeat and neither had their new leader been given enough time to bed in and win the public round. But the party had begun a radical shake-up of its organisation in preparation for the election that everyone knew was coming and its campaign was much more professional as a result. For the Liberals a second election in such a short space of time was a severe financial blow, but they soldiered on, offering the voters a non-socialist alternative to Labour. For Wilson the campaign was simple. Labour had set out its stall in 1964 and now the party was asking for a mandate sufficient to enable Wilson to put his policies into practice. The voters seemed willing to oblige despite Conservative warnings that backing Wilson would see Britain "vote now and pay later". 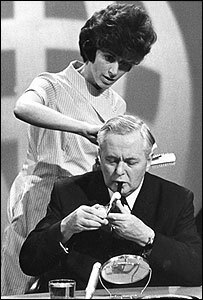 Once again Labour focused its campaign on Harold Wilson, but for Edward Heath, only a few months into the job, the election must have seemed like a baptism of fire. His election as party leader had healed some of rifts that resulted from Sir Alec Douglas-Home's leadership and saw the party present a much more modern face to the public. But although he was a product of an ordinary middle class family in a way similar to that of Wilson, his personality was not the asset to the Conservatives that the wisecracking, pipe-smoking family man presented by Wilson was for Labour. Heath, a bachelor, a former Conservative chief whip and supporter of Macmillan, was quickly seen as cold and aloof by the voters. His campaigning style was wooden while he was prone to sulk when he failed to win his colleagues round to his own point of view. Liberal leader Jo Grimond fought hard to avoid the inevitable reaction of floating voters to turn to the Conservatives while Labour was in power, but it was a fight he could not win. There was just one over-riding issue in this election as far as Labour was concerned - securing a mandate. The party's manifesto was blunt and to the point with its title, Time for a Decision. Other themes followed up on Labour minister George Brown's National Plan for the economy set out in 1965, as Labour promised similar plans for transport and the regions. The commitment to re-nationalise steel featured once again as the party had failed to take it back into the public fold during its 18 months in power. Labour was also keen on closer relations with Europe, a theme echoed with varying levels of commitment by both the Conservatives and the Liberals. The Conservatives focused heavily on the economy, stressing that action needed to be taken over rising prices and pledging to reform trade union relations. In their manifesto - For All the People - the Liberals also promised a look at trade unions and entry into the European Common Market as well as cuts in defence spending.